Take $135 off with coupon code MARCH135. Expires 3/31/19 and may not be combined with any other offers or special pricing. 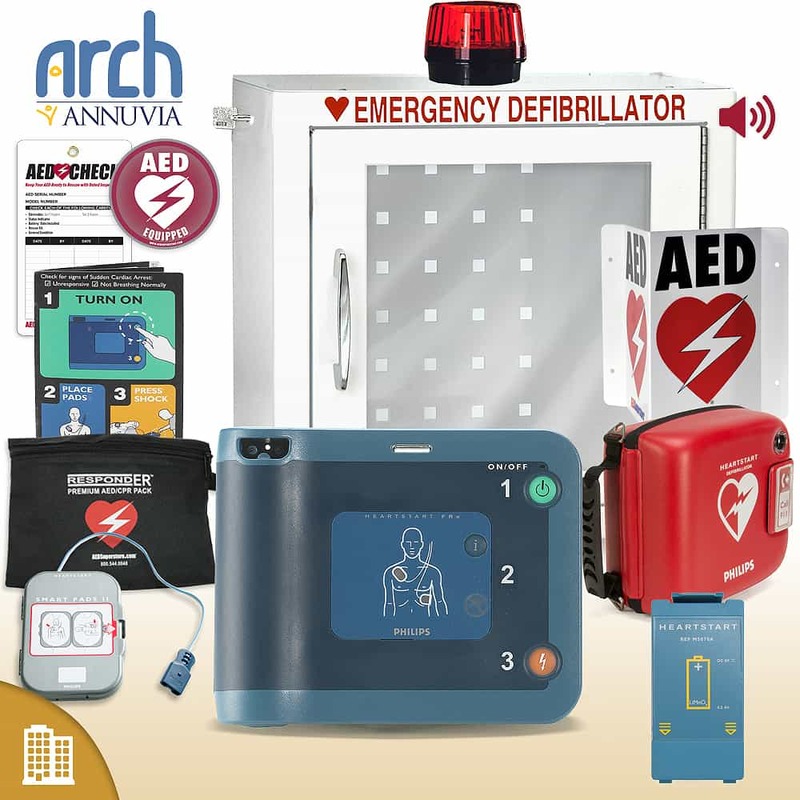 Philips HeartStart FRx - includes 8 year manufacturer's warranty, adult electrode pads, battery, and quick reference card. 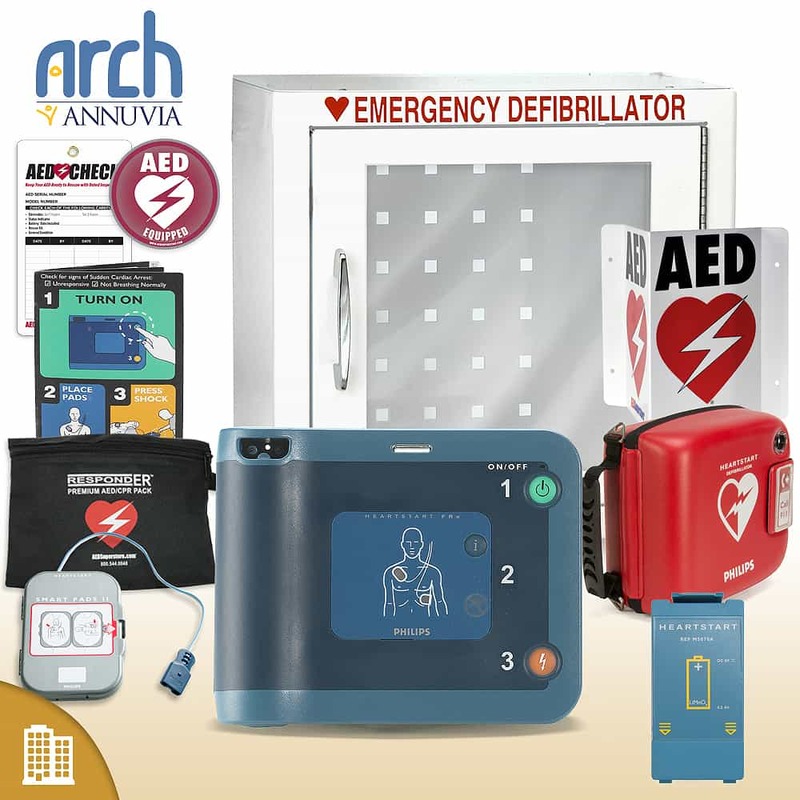 ArchTM AED Medical Direction and Program Management - A national team of state-specific physicians and an easy-to-use online platform provides quality control and Good Samaritan compliance for your AED. Semi-Rigid Carry Case - With compartments for a Spare Battery, Spare Electrodes, Infant/Child Key. RespondER® Premium AED/CPR Pack - Premium kit includes a full-size CPR Mask in nylon heavy duty pouch. The best kit available! Responder® Premium Compact Size AED Wall Cabinet - Ruggedly constructed metal surface mount cabinet, optional alarm or alarm & strobe available. Made in the USA! RespondER® Flexible AED Wall Sign - Three-dimensional, flexible AED wall sign to identify the location of your AED. AED Check Tag - Use this quality AED Check™ Tag as a record of your AED inspections. AED Window/Wall Decal - 4" Diameter. Let others know there is an Automated External Defibrillator on the premises.